It’s no secret that Maxwell Roofing & Sheet Metal, Inc. loves our employees. Our employees not only work tirelessly each day to exceed customers’ expectations, but they live and breathe the Maxwell Roofing mission, vision, and values. In fact, our company’s legacy maintains its trusted reputation because of our employees’ commitment and excellence in performance. As one of the ways our Maxwell Roofing leadership team shows our gratitude throughout the year, we host the much-anticipated Summer Kick-Off party the Friday before Memorial Day. This year’s celebration was held during lunch hours on May 25, 2018 at the company warehouse (which we’re quickly outgrowing). “The real purpose of the Maxwell Roofing Summer Kick-Off Party is to rally the entire company together, say thanks, and boost morale as we embark upon the year’s hottest season,” says Kathleen Maxwell, Vice President of Sales. 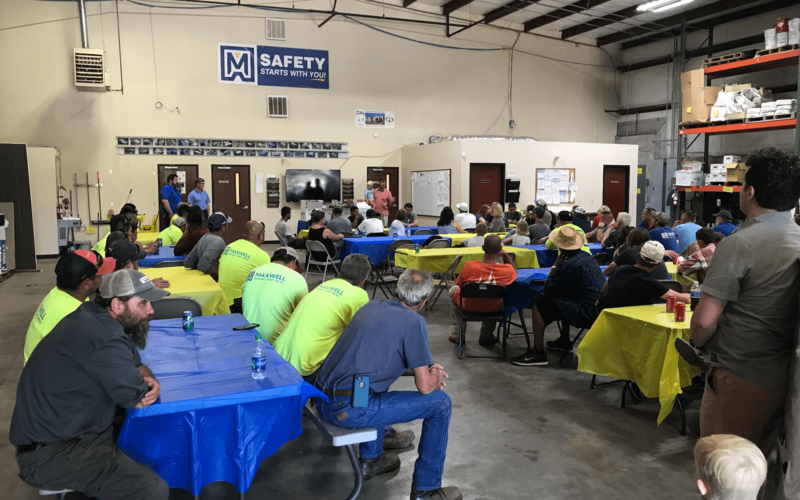 Since summer is typically the busiest season for the Maxwell Roofing team, the Summer Kick-Off Party has also become a positive way to remind employees about safety and the nature of upcoming jobs to keep them engaged. A complimentary lunch is also provided at the party for employees and their families as a way to show appreciation and celebrate their many accomplishments throughout the year. During the event, Maxwell Roofing’s President, John Maxwell, and the operations team (led by Keith Stiles) also highlights recently completed projects, company and individual accomplishments, as well as upcoming projects, which helps employees get a great overall picture of the collective work being achieved together. Following lunch, the Maxwell leadership team presents fun “swag” to all employees, in addition to holding a raffle for prizes. “We also capture and celebrate the accomplishments of our field crews. Above all, we want these events to be centered on showing appreciation for our team and crews, highlighting all the many ways they help Maxwell Roofing be successful,” adds Kathleen. The Maxwell leadership team’s goal is to keep the celebration brief so that employees can have an early end to their work day. “Not only do we want to celebrate our employees while enjoying a dedicated time of fun together, we also want to show appreciation to their family members, who are in many ways an extended part of our team. Thus, we invite families to the event and encourage employees to take the rest of that work day to spend time at home or however they need,” Kathleen affirms. With a growing team and continued successes, the Maxwell team carries on, looking forward to the many future opportunities to serve customers with excellence and celebrate together along the way. Curious to know more about the Maxwell Roofing & Sheet Metal, Inc. team, company history, or services? Visit our “About” page or contact us today!